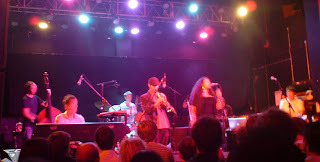 Saturday saw the return to Manchester of part local band The Cinematic Orchestra. Drummer Luke Flowers and guitarist Stuart McCallum are regulars on the Manchester jazz circuit and have been mentioned numerously on this blog already. The bass player Phil France is mcr based as well I think and the Cinematics used to have both local boys John Ellis and Steve Brown on keys at different times in the past. I'm a really big fan of the Cinematic Orchestra but to a certain extent I wasn't looking forward to the gig as much as I might as I'm not a fan of the Manchester Academy venues at the best of times. They are essentially little more than sports hall spaces that utterly lack atmosphere to my mind. I'm also if I'm honest a bit disappointed with the latest record 'Ma Fleur' that I don't think matches the previous two records, albeit having a few really great tracks. Nevertheless it wasn't a bad gig. The band are near the end of a long tour and looked a bit haggard but the playing had energy. They are a much more improvisational group than I've seen in the past which some folk may see as a step in the right direction, but I really liked the tight and sparse arrangements of the 'Man With the Movie Camera' era. As much as I love the guitar (being a player of one), I'm not sure it adds to the their sound. In many ways what I liked about the Cinematics was that they sounded very different to most other groups, being both er... 'cinematic' and 'orchestral' as per their apt name and I think this has been lost to some extent. Overall the sound is much more dense and busy. Still, this may be welcome to some and there's now more homage to the 'Art Ensemble of Chicago' influences with a few quite intense free improvisation sections in the set, latterly in the 'Man With the Movie Camera' track itself. Mr Flowers was, as usual, excellent and clearly lapping up the applause at the end of the show. In summary, good but I know can do better. 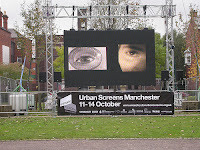 I mentioned the '2008: Man with a Movie Camera' experiment in database cinema' in a post below that was part of Manchester Urban Screens 2007. I uploaded an image as I suggested I might and it's nice to see it is being used as part of an extract demonstrating the project. It looks like the project was very successful with the New York based electronic media artist, Perry Bard, being commissioned to contribute to The Bigger Picture touring programme. The uploaded images were shown alongside the original film and it works really well. My own contribution was a photo of my wife's eye and was the first picture I ever took on a camera phone. P.S. Just noticed Perry has put the picture up on Flickr as well. The jam scene in Manchester continues it's ebb and flow with the appearance of a new one at The Carlton Club in Whalley Range on the last Tuesday of every month. I've not checked this one out myself yet but I'm aiming to as soon as possible. It's free for performers and £2 for listeners, boozers, scenesters etc. The Carlton Club is described as "a big comfortable Victorian mansion. It's a bit worn around the edges but has a cozy feel, two giant snooker tables and offers cheap drinks". Sounds really quite charming to me. I heard about this new jam from a recent NWJazzworks newsletter and initially assumed it was something to do with the Extraordinary Rendition Jazz nights, but they're every other Thursday so it doesn't look like they are. I'm not sure who's behind them. 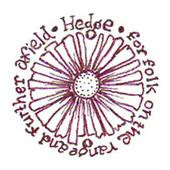 I've also been meaning to get down to the Hedge folk nights also at the Carlton Club that Jon Thorne mentioned to me after one of his gigs. I notice he's playing there in his folk guise - looks promising. The Hedge nights have been off for the summer I think, but are back from October the 15th. I have to confess that I used to be a bit anti folk but I'm mellowing out these days as most folk do. I've spoken to a few people who've been to the Hedge night and have given really good reports. I believe also that it can sell out so it's probably worth getting down early or at least checking with them on that one. "Based on the original photographic work of Edward Muybridge's study of pigeons in flight this work utilises Bluetooth technology to build an interactive environment in which pedestrians control the number of birds based on the number of enabled mobile devices present within a 10m/33ft range. 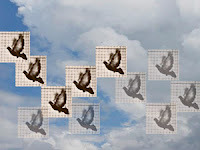 The pigeons appear to fly over a virtual Manchester skyline while commuting pedestrians travel beneath." Joel had shown me a sneak preview of this in the summer and I mentioned it in a previous blog post not knowing it was going to be part of such an illustrious event. I'm sure it'll take on a whole new life in this large scale context. Looks like there's plenty of other interesting stuff going on as well. 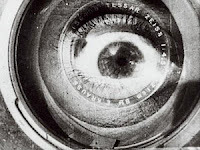 One thing that caught my attention is the '2008: Man with a Movie Camera' experiment in database cinema on from 9am till 10am the same day - "Individuals are invited to upload shots and scenes based on scenes from the original film, creating a database which then streams as a film". Interesting, as I love this film having been introduced to it by the fantastic Cinematic Orchestra record of the same name (also highly recommended). I may try and contribute to this event as all are invited to by the artist. Went to a really inspiring gig by jazz and film composer Mike Gibbs and his Big Band at the Royal Northern College of Music last night. It was very powerful and potent stuff right from the off and immediately upped the excitement levels. To my ears much of the earlier part of the first set was classic 1960s sounding stuff and had me picturing spy's in black and white movies shuffling about near the Berlin Wall . The star studded cast included guitarist Bill Frisell, bass player Steve Swallow, sax players Chris Hunter and Stan Sulzmann and drummer Adam Nussbaum who were all on great form. Adam was really enjoying himself and the energy in his playing was quite infectious. The second set included some more contemplative and unusual pieces along with some rousing standards including an arrangement of Miles' arrangements of Monk's 'Round about Midnight' and Parker's 'Au Privavé'. 'Matter of Fact', a new track complete with a cool repeating 7/4 figure was stretching Mike's conducting skills to the limit. The picked line from Frisell echoed on the piano concluded the track in a most satisfying way. I'll be buying the record this track is on for sure. 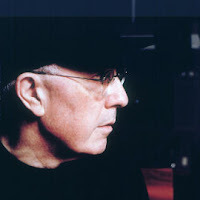 Mike Gibbs is the stuff of legend being born in Zimbabwe and trained at the famous Berklee College in Boston, where he continued as Composer in Residence for many years. He has written and arranged for many of the jazz greats over the years including Pat Metheny and John McLaughlin to name just two. We went along with guitar tutor Mike. A fair few other members of the MCR jazz posse were in attendance including Andy Schofield, Iain Dixon, Nick Mellor, Sam Smith, Jo McCallum and Anton Hunter. Mike, Iain and Andy have all worked with Mike Gibbs in the past, Mike and Iain having played on the 1996 album 'By The Way'. A few drinks in the RNCM bar after the gig confirmed it was a bit of a classic. Some professed to be very inspired and promised to put pen to manuscript paper or fire up Sibelius on getting home. I had a good chat with Mick and Steve who run NWJazzworks and the Manchester Jazz Festival and who I'd alerted earlier that day to the blog awards and recent press this blog has had. Looks like I may possibly get involved in working with them in some way which would be great. A most pleasant evening all round. "This album is the first under my name. It's about dissonance masked by consonance, and having clear statements despite the density. I wanted the harmony to be supported by the melody. I wanted the rhythm and bar lengths to feel completely natural, even though they're not. I wanted it to be singable, and street-walk whistleable. I didn't want the face to reflect the inner workings." The intriguing album title is taken from 'The Divided Self: An Existential Study in Sanity and Madness', a book by the Scottish psychiatrist R. D. Laing and is a quote from English literary critic and poet William Empson. Getting the album mixed has proved to be a study in sanity and madness for Mike and Iain who had paid a significant sum of money upfront to the presumed to be trustworthy Steely Dan producer Roger Nichols who is based in the US. Roger accepted the work and the money but then proceeded to do nothing. Progress reports on the mix were given along with promises that it would be ready 'in a week or so'. However no mixes were forthcoming and Roger proceeded to go AWOL. After a year of constant hassling from Mike and Iain, the music was returned unmixed but still no cash was to be seen. It's taken almost two years and a sustained email campaign by Mike and friends, but after much heartache and stress for all concerned they eventually got the cash back courtesy of Roger's boss and have finally been able to go ahead and get the album mixed. The man himself is yet to resurface and has not offered so much as an apology. I haven't heard a note of the record myself yet so I'm really looking forward to the conclusion of this long running saga. "... takes two signals and produces a signal containing the sum and differences of those frequencies ... a very commonly used effect in early electronic music"
Featured in The Guardian UK national newspaper. Shortlisted for 'best arts and culture' blog in the Manchester Literature Festival Blog Awards.